Disney and Pixar have taken the dubious idea of continuing the relatively self-contained story in Finding Nemo and turned it on its head thirteen years later with the entirely endearing, but misleadingly titled, Finding Dory. Comedian Ellen DeGeneres returns to voice the short term memory loss inflicted blue fish Dory on her search to find her parents and reunite her family. Albert Brooks and Hayden Rolence (replacing Alexander Gould) as clownfish father and son, Marlin and Nemo, are more side characters to support Dory's journey and pay off her initially silly seeming comic relief arc from the first film. Co-writer/director Andrew Stanton fills the animated film with enough new and fresh elements to make Finding Dory more than a retread or exercise in nostalgia as the trio of fish embark on a journey from Australia to California meeting all sorts of new sea life along the way. Pixar has unsurprisingly assembled a varied and amusing group of voice actors. This is most evident with Ed O'Neill voicing the wonderfully lively Hank, an ill-tempered, seven-tentacled octopus (aka "septopus"). He really elevates some of the more standard material while injecting a welcome sense of vibrant energy into the action. Ty Burrell, Kaitlin Olson, Idris Elba, and Dominic West all voice fun sea creatures in and around the Marine Life Institute while Eugene Levy and Diane Keaton inhabit Dory's very warm parent fish. 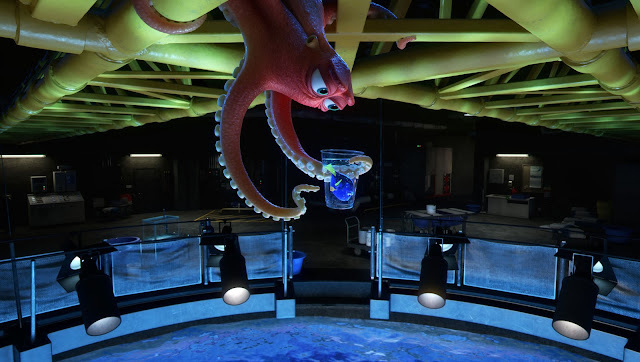 Stanton recreates most of the wonder and magic of the Finding Nemo while making the tired seeming premise fun and energetic enough to satisfy viewers and fans of the original. it really doubles down on the first film's story and themes while connecting us with Dory's sense of loss and lack of short term memory condition. The film is heartfelt and true while being crowd-pleasing and undeniably pleasing if still overly familiar. Finding Dory is a fairly light and appealing direct yet somehow still loose sequel to the original with the same heartwarming themes about loss and family with a few nice twists. It's sublimation on living with a disability is blunt but still effective. What's most intriguing about the film's own premise and story is the way it justifies its existence and makes a case for this kind of long after the fact sequel.